This is a repost of the recent annoumcent. I am pleased to announce that TalkGraphics is running on version 3.6 of vBulletin. There are many new features, but here I've outlined a few of the key ones that will benefit you. The much-requested multi-quote feature allows users to tag multiple posts that they wish to respond to by clicking a small button on each post. Once the user clicks the reply button, each tagged post is quoted. To increase usability, by default, only posts within the current thread are automatically quoted. If you wish to quote posts in other threads with multi-quote, you simply need to click a link on the reply page, and the text of those posts will be added without a reload. If you wish to mark a forum read, you can simply click its status icon on the index page and the change will be processed without a reload. You can even mark individual sub-forums as read in the same way. [Antony - I seem to need to double click the icon]. When quoting a post, the ID of the post is automatically included with the [quote] tag. When the quoted text is viewed in a thread, a small icon links back to the quoted post. You may now choose how threads will be sorted on a per forum basis. Options include the field and direction to sort using. The paperclip icon that denotes whether a thread contains attachments is now clickable. It will pop up a window that shows a list of all the attachments in the specified thread, including file size and number of views. A number of you have discovered this by now. 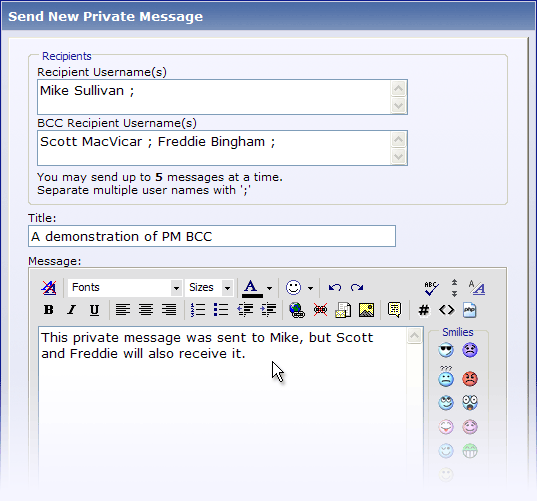 Like in an email, BCC (blind carbon-copy) allows you to hide the full list of recipients from each recipient. 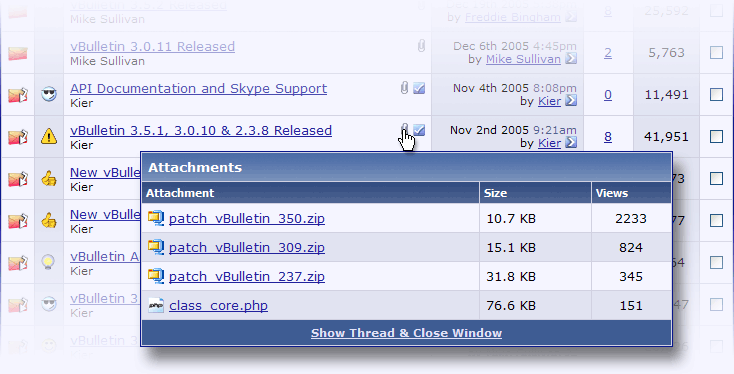 In previous versions of vBulletin, the “to” field acted like a BCC field. Now, the “to” field acts like the field in an email; each recipient will see all the names in the “to” field. I'd start a revolution, if I could get up in the morning. 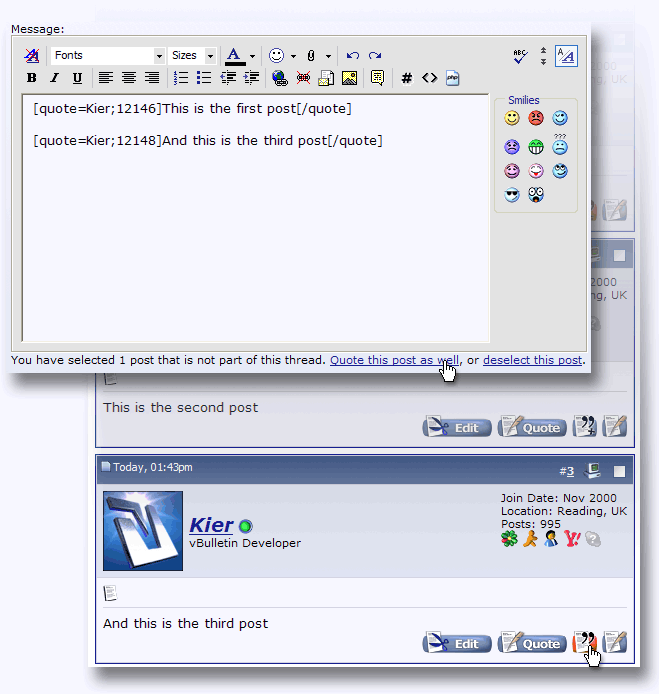 Mark Forums Read with AJAX - You can even mark individual sub-forums as read in the same way. (Antony - I seem to need to double click the icon). This only seems to work for a short period. If you drill down into a forum, read a thread & return the icon reverts back to the "New Posts" icon. Anyone else find this the case? So you mark it as read first and you go into the forum and read one of the threads that was unread (now shows as read) and return to find the icon has reverted back to unread? I didn't get this. reading all the threads with new posts in a forum and in the last thread, returning to the forum's main index (via the link in the breadcrumb, top of the page) shows me that forum as still unread. Going there again shows all threads as "read".